Supposed author of a cabalistic work which is often quoted by Recanati, in his commentary on the Pentateuch, under the title of "Baraita de-R. Yosef b. 'Uzziel," which is entitled "Mishnat Yosef b. 'Uzziel" in Neubauer, "Cat. Bodl. Hebr. MSS." (No. 1947, 3a). Neubauer describes this work as a commentary on the "Sefer Yeẓirah," but it seems from Oppenheim ("Ḳohelet Dawid," p. 352, No. 965) that it is a supplement to it. Under the title "Shorashim" a copy is found in the Parma Library (De Rossi, No. 1138, 12). 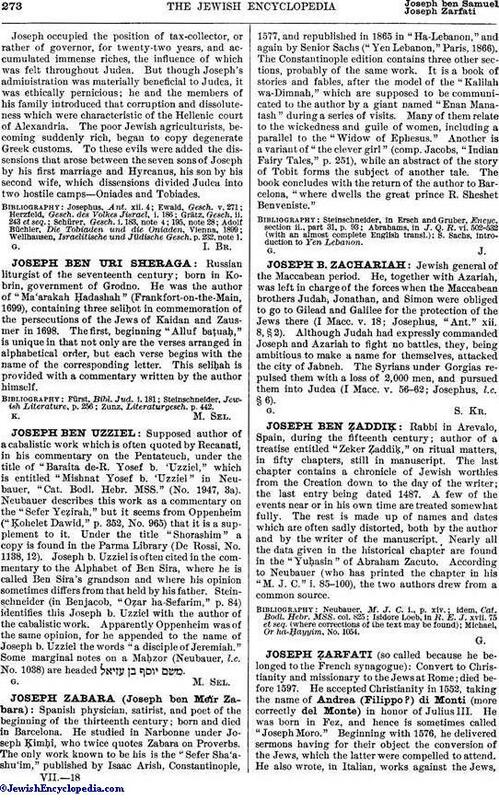 Joseph b. Uzziel is often cited in the commentary to the Alphabet of Ben Sira, where he is called Ben Sira's grandson and where his opinion sometimes differs from that held by his father. Steinschneider (in Benjacob, "Oẓar ha-Sefarim," p. 84) identifies this Joseph b. Uzziel with the author of the cabalistic work. Apparently Oppenheim was of the same opinion, for he appended to the name of Joseph b. Uzziel the words "a disciple of Jeremiah." Some marginal notes on a Maḥzor (Neubauer, l.c. No. 1038) are headed .